use DAX to implement "date selector aware" measures. The idea here is to repeat each fact row for each date column that you want to select on. OrderDate, DueDate and ShipDate are the 3 columns we want to select and filter on. Notice that we combine the name of the date column along with the date value to form a Date Key. Because Date Key contains the name of the column under which the date value was found, we have the foundation for filtering dates that originated in different columns. Once the data is pivoted this way we bring it into PowerPivot as the Sales Orders table. A stock-standard "date dimension" to represent the hierarchy of years, months and dates. Contains 3 rows to present a selection of which column any Date filtering should be applied on: Order Date, Ship Date, Due Date. This table is cross-join of Date Type and Date, bridging any combination of Dates + Date Type to a Date Key. The PowerPivot engine always implements filtering as "parent to child", meaning Date Type and Date impose filtering onto the Date Filter table. The Date Filter in turn imposes filtering down onto the Sales Orders table via the Date Key column. The other method of achieving the same result is by implementing all measures as DAX calculations. The above is hideous to read and hard to maintain, but it does get the job done without having to transform the source data. Performs well because the formula engine can apply filters when retrieving rows. Performs slower because all rows are traversed for each cell being calculated. Easy to build & maintain. Requires working knowledge of DAX. Complexity increases with every additional date column. Produces incorrect results of no, all or multiple “Date Types” are selected. DAX calculations can detect invalid filtering criteria and return more appropriate results. 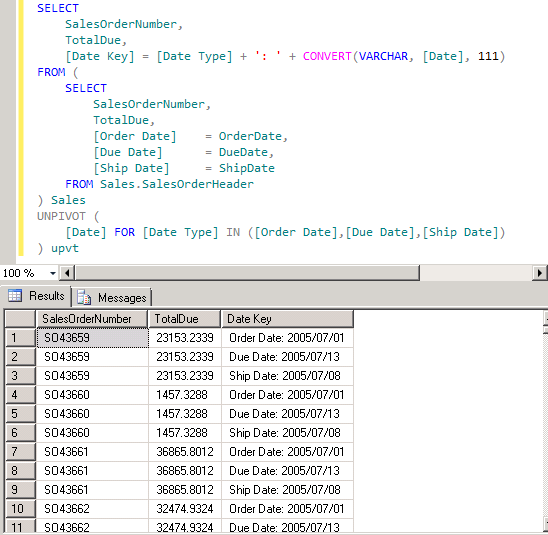 Fact rows are multiplied by the number of date columns made selectable. Fact rows retain original granularity, improving the reusability of the tabular data. The importance of performance can't be overstated on large data sets - DAX calculations quickly slow down when the formula engine can't apply adequate filtering when retrieving rows from the storage engine. If you're working with smaller data sets, then UNPIVOT has a clear disadvantage of producing wildly incorrect results when the users clears the filtering on Date Type. My advice: If you understand and can optimize DAX and you're dealing with mildly brain-dead users, then implement the filters as DAX calculations. If, on the other hand, you are relatively new to PowerPivot, then go the UNPIVOT route - its faster and easier. It seems that both of these solutions have issues. Why is it a problem to have multiple date dimensions? It is easy enought to include additional date dimensions and to rename them appropriately. The idea of having a single Date dimension is that it allows time based intelligence calculations to work correctly in any context selected by the utility dimension. Moreover, a utility dimension encourages data exploration for end-users, by allowing then to simply choose a new filter in a slicer, rather than having to completely reconstruct pivot tables using different Date dimensions.